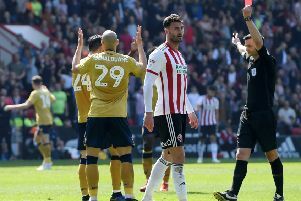 Sheffield United manager Nigel Adkins has thrown down the gauntlet to new signing David Edgar, challenging the Canada international to make his presence felt on and off the pitch at Bramall Lane. Edgar is expected to make his debut during tonight’s Capital One Cup tie at Morecambe as the visitors look to bounce back from Saturday’s 4-0 league defeat by Gillingham. Adkins, who acknowledged that result had prompted a “frank inquest” behind the scenes, cited the 28-year-old’s “experience and physicality” as catalysts for the move. “David has worn the captain’s armband for his country,” Adkins said. “You can’t have enough leadership at a club and I’m looking for everyone to develop their qualities in that regard. “We’ve done some research into his character, as we always do, and he’s got a good attitude about him. As The Star revealed yesterday, Adkins’ interest in Edgar can be traced back before United’s defeat at Priestfield where, despite some impressive pre-season displays, three of the four goals they conceded came from set-piece situations. A centre-half, Edgar was a member of the Burnley squad which reached the Premier League in 2010 and arrives on a season long loan from Birmingham City.